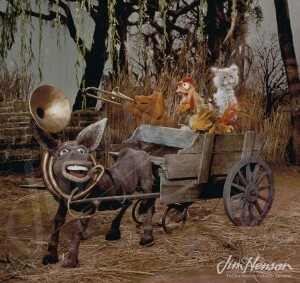 The Muppet Musicians of Bremen was the third television special inspired by a traditional story in the Tales from Muppetland series. While also narrated by Kermit, it veered from the European style that provided the look of the first two and was set in the swamps like those in Mississippi, the state where Jim was born. Jim had warm memories of his Delta boyhood and used the swamp setting again as Kermit’s home in the opening of The Muppet Movie. 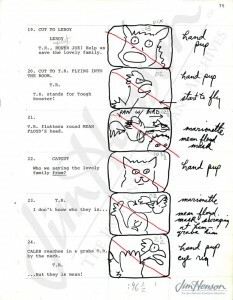 The “Blue Bayou” set of the Linda Ronstadt Muppet Show episode and the lush scenes in The Dark Crystal also reflect Jim’s affection for these swampy settings and his recognition of their cinematic possibilities. 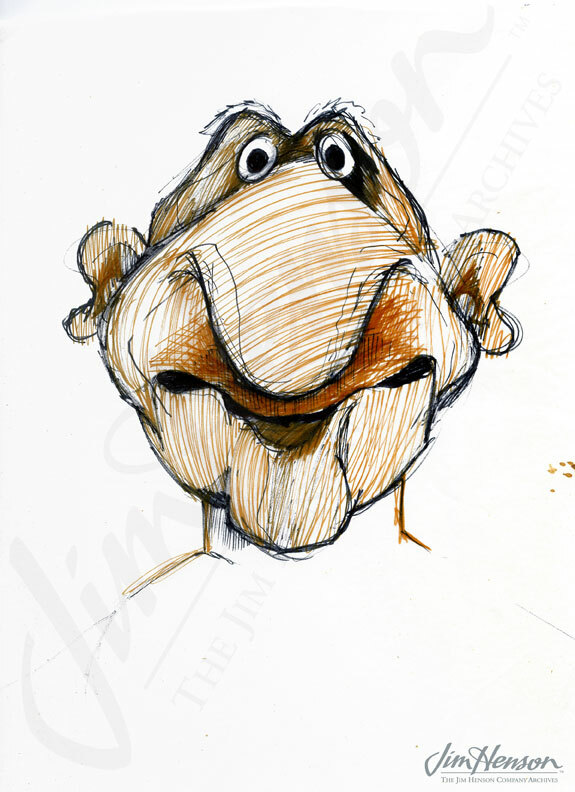 As his company grew in the late 1960s, Jim began to bring more people onto his creative team. Bonnie Erickson and Caroly Wilcox, both accomplished builders, joined for the production of The Tales from Muppetland specials and introduced new modes of construction to the workshop. Unlike with Hey Cinderella! and The Frog Prince, there were no live actors in Bremen. The villains were played by actors wearing oversized foam heads and hands, turning them into life-sized puppets, an idea from Bonnie Erickson. 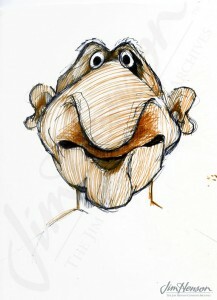 The production utilized dual versions of the barnyard animal characters: hand puppets for close-up shots, and full body marionettes for shots taken from a distance. 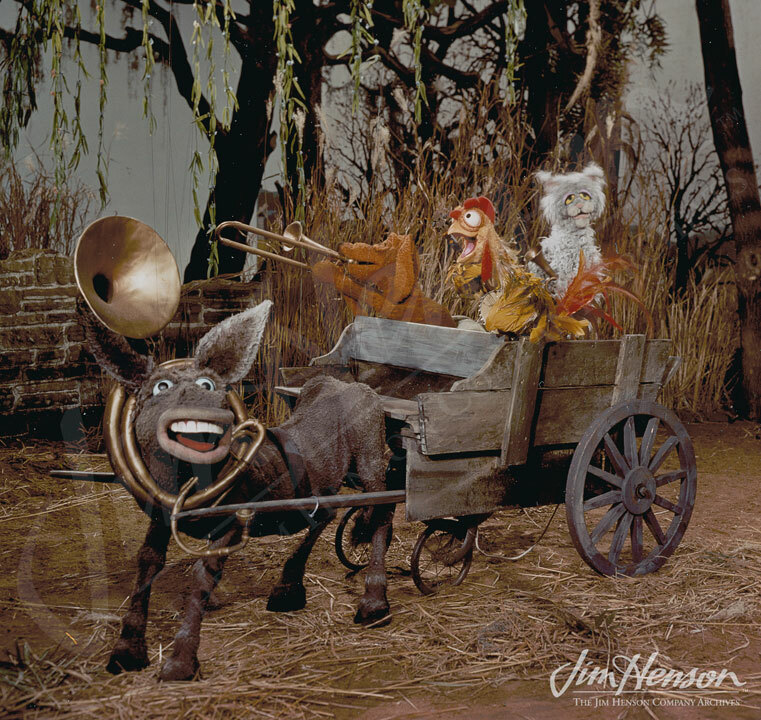 Jim screened The Muppet Musicians of Bremen for friends and colleagues, and in April 1972, the show aired in syndication across the Hughes television network. Like The Frog Prince, a separately recorded version was released as a children’s record album later that year. 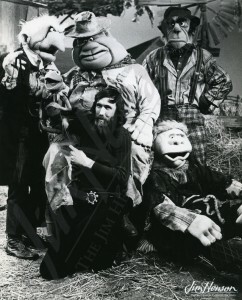 Jim and the bad guys from The Muppet Musicians of Bremen, 1972. Bonnie Erickson’s design for Caleb Siles, 1971. Barnyard animal puppets from The Muppet Musicians of Bremen, 1972. 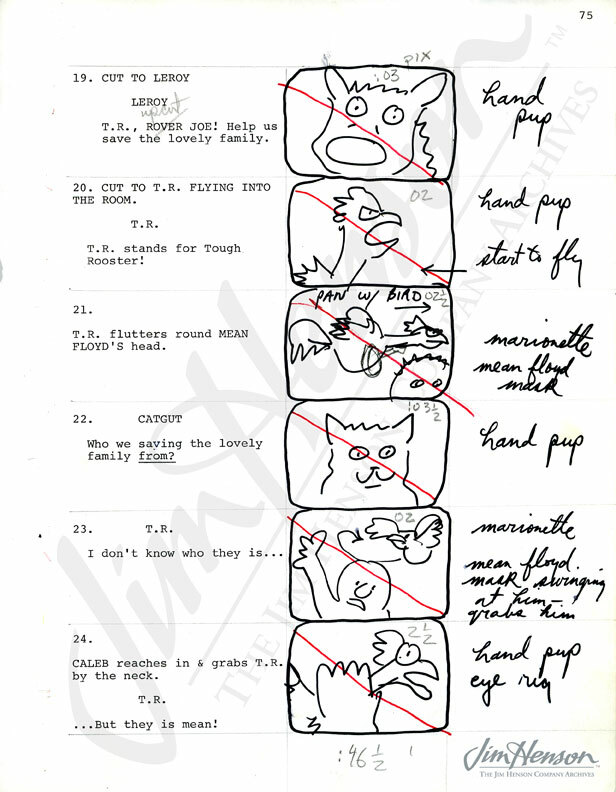 Page from Jim’s Bremen directing script noting whether to use a hand puppet or a marionette, 1972. This entry was posted in 03-March '72, 1972, Muppet Musicians of Bremen and tagged Bonnie Erickson, Caroly Wilcox. Bookmark the permalink.